It has been a while since the last PTC meeting, where some Tata people said that the TGN-IA will be launched in a matter of weeks. Yes, sure, what's the problem? we can convert every time measure in "weeks" :-D ... More importantly, it has indeed been launched: "... announced that they have completed the installation, testing and commissioning of the TGN-Intra Asia (TGN-IA) Cable System. Arriving at the conclusion of a comprehensive test program, which verified compliance with all transmission requirements, the companies have completed the final step in achieving regional and global connectivity in Southeast Asia for the TGN". 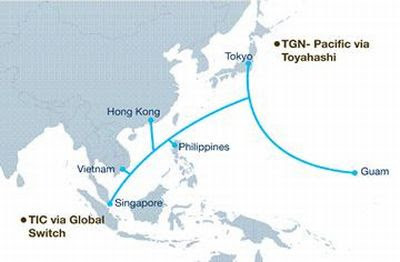 The fully operational 6700KM TGN-IA system links Hong Kong, Singapore, Tokyo, Vietnam and the Philippines, providing route diversity throughout the Asia-Pacific region. The system, which was strategically designed and routed to avoid earthquake and hazardous areas in the Asia-Pacific region, has an initial design capacity of 3.8 Tbps on a city centre to city centre basis and provides record breaking latency between South East and Northern Asia. When combined with the Tata Global Network TIC and Pacific cable systems, the Intra Asia cable system will complete Tata Communications’ multi-Terabit capability from India to Asia and onward to the United States, and is a strong complement to existing regional systems. The System integrates seamlessly with the Tata Global Network and is a key piece in enabling Tata Communications’ global connectivity. 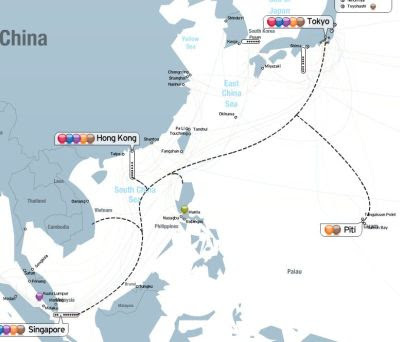 Tata Communications and its supplier, Tyco Telecommunications, have announced the completion of their 6,700km TGN-IA (TGN-Intra Asia) cable system connecting Singapore, Vietnam, Hong Kong, the Philippines, Tokyo and Guam. The companies say they have completed the installation, testing and com- missioning of the systems following a comprehensive test program, which verified compliance with all transmission requirements. The TGN-IA system has been operational in Singapore, Philippines and Hong Kong for the past few months and served as a critical link in the past week in light of the massive outages to other cable systems in the region.